The three-night crossover came to a close on Supergirl while announcing the upcoming crossover for fall 2019, Crisis on Infinite Earths, which left fans of the Arrowverse overjoyed. On this crossover, we immediately find out that the black-suited Superman who confronted "Trigger Twins" Barry and Oliver was Deegan. After The Monitor told him to "think bigger," he let his God-complex get to him. In his alternate-reality, Barry and Oliver don't have powers and must rely on their wits to outsmart to him which they do so successfully. They reason that since they are the opposite of who they're supposed to be, Cisco is probably also a bad guy. Alas, they find Cisco, now going by Mr. Ramon, as a drug boss. James Olsen, now Superman's worst enemy, now works as his muscle taking care of anyone who gives him trouble. When Barry and Oliver come to Mr. Ramon, James beats them up. Cisco is about to let James "take care of them" in the alley when Barry mentions that he knew Cisco's brother. He agrees to hear them out and when they offer to teach him how to vibe to 17 different Earth's, he agrees to help them. They vibe to Earth-38 to enlist the real Superman's help. Upon hearing of the new reality set in motion by Deegan, Superman agrees to help them. They vibe into STAR labs just as Supergirl and alt-Alex are being confronted by Superman. He calls alt-Alex a traitor, but after being convinced by Kara's Japanese "pinky swear" rhyme which she said her Alex taught her the first time they went flying. Despite not knowing Kara, alt-Alex believes everything she says and frees her from the pipeline. As real Superman fights dark Superman, Kara, Alex and Barry retrieve the Book of Destiny. Kara runs it over to Superman who knows how to restore their reality, but when dark Superman gets ahold of The Flash and urges Arrow not to channel his darkness and kill, dark Superman gets away. As he's attempting to bring back his alternate reality, Supergirl and The Flash plot to run in opposite directions around the Earth to slow time allowing Superman to grab the book back. Superman warns them that he saw the future in the book and this very mission leads to their death. Oliver then realizes destinies can be changed and he confronts The Monitor about not allowing Supergirl and The Flash, the "good ones," die. The Monitor tells him there needs to be a balance. Superman is fighting dark Superman smack dab in the middle of the city. Lois Lane, J'onn and Brainy arrive as reinforcements, however, when Supergirl and The Flash are finally able to slow down time, Arrow uses it to shoot an arrow at the book thus destroying it and dark Superman. Supergirl and company head back to National City where Clark tells her that he and Lois are expecting a baby. He also reveals that they are moving to Argo where it's safer now that he knows Earth is in Kara's capable hands. Over on Argo, Clark proposes to an overjoyed Lois. 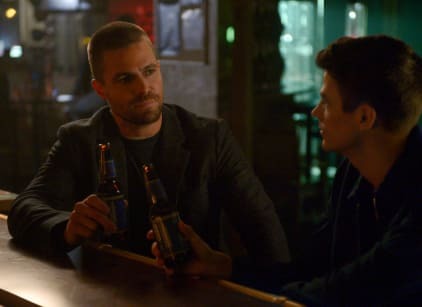 Meanwhile, Oliver and Barry bro-out over some beers. They now share a deeper bond as they know what it's like to be each other. Oliver admits he hasn't gotten a hold of his darkness just yet but he's on a better path. He makes an ominous remark about appreciating what you have while you have it which led fans to believe he sacrificed himself for The Flash and Supergirl. Batwoman calls Arrow to inform him that Deegan is going to be a bigger problem than previously assumed as he made a dangerous ally at Arkham.